Shen Zhen Mingda Technology Co., Ltd.
1. MINGDA 3D printer takes 57 stepper motor, ball screw. 2. MINGDA 3D printer machine takes 1.75mm extruder, which is more precise and compatible with more material. 3. 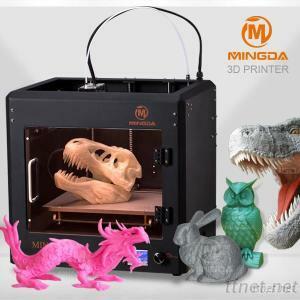 MINGDA 3D printer support USB and SD card printing. 1. Open design, can choose your own body color. 2. Easy to operate and enjoys low-cost maintenance. 3. Widely used for different areas, like art, archittecture, Aviation, biomedical, etc. 5. Standard industrial grade high-quality 3D Printing effect. Dual ball screw structure makes the printing effect more perfect. the appearance is elegant and graceful!